We are all fed up! Crazy Soccer Parents, unrealistic expectations from parents and coaches, some coaches who too often care more about the game than the child, the high cost of soccer participation and the overburdened and overwhelming path to the next level (and then the next) has pushed parents, coaches, clubs, and administrators to this tipping point. Parents, coaches and players have had enough. We need to ensure that the change that happens is, in fact, the change our children so desperately need. And that is why you, the parents, must get more involved. You must get more engaged, more connected to youth soccer so you become an active part of the solution your child, and the next generation of children, deserves. Parents have historically been cast as bystanders to the youth soccer experience of their child. Coaches and clubs must actively seek and welcome parent engagement, and parents must embrace it. I get it, you haven’t wanted to be more involved because you don’t want to be perceived as a Crazy Soccer Parent, or maybe you feel like you don’t know enough about the game to have an opinion. You haven’t been more involved because of the awkward dynamic that too often exists in the coach-parent relationship where coaches are not opening the door to parents and are even being instructed not to open the door to you by their coaching mentors. Of course, most of you are Level-Headed Parents and you haven’t been more involved because you know that in an ideal youth soccer environment you should be a bystander to your child’s sports experiences. This is not an ideal youth soccer environment. One of the most important things you do as a youth soccer parent is to find an environment for your child that suits their athletic potential, mentality and your family situation. 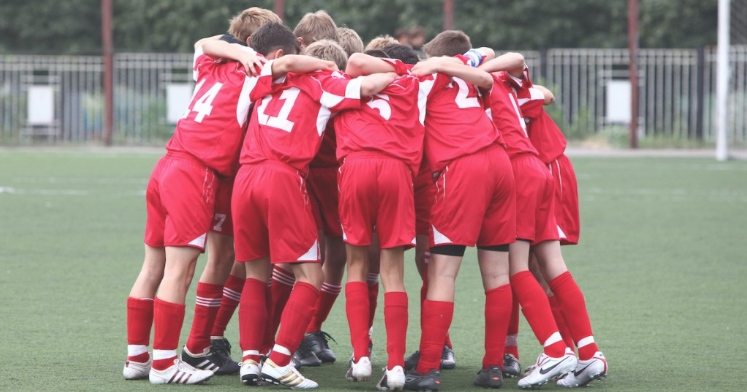 You need to develop your understanding of the Athlete Development Model from the U.S. Olympic Committee and U.S. Soccer and gain knowledge about the various pathways available to children, affirm which pathway your child is on, and embrace the experiences associated with that pathway – whether it be participation or performance. Too often in youth soccer the line is blurred between participation and performance and players who are best suited to a participation environment get sucked into a performance environment. When parents understand the various pathways, they can advocate for their child to ensure the appropriate one is available to them. We talk a lot about Winning versus Development and while strides have been made in taking the focus away from winning – it unfortunately remains a driving force in youth soccer. Winning, instead of Competing, continues to be the engine that is too often pulling the train. • Winning in league play to get high rankings to gain admission to tournaments where college coaches are scouting. • Winning the game by focusing more on the athletic talents of the players than their soccer awareness. And then the secondary issue is development. As development has become a buzzword for parents and coaches we have naturally focused more and more on development. Along those lines, coaches add extra practices and longer seasons, parents sign kids up for extra personal training, camps and more. While the result of this extra training may (or may not) be development – too often we lose perspective. We forget that the real development we seek for our children – is a development of a love for the game. Parents, we need you to be MORE involved in order to take the power away from the Crazy Soccer Parents who have been ruling our sidelines and guiding the behavior of the coaches. You too often live in fear of being classified as a Crazy Soccer Parent (who can blame you?) so when you have a genuine issue with a coach or your child, you don’t speak up. Coaches have been overburdened by Crazy Soccer Parents who are irrational, not willing to listen to reason and who are living vicariously through their child that coaches have understandably shut out all parents in an effort to avoid the crazy ones. This Crazy Soccer Parent environment can’t continue. It’s time for the Level Headed Parents (that’s you!) to rise and push the Crazy Soccer Parents away. A Crazy Soccer Parent needs to feel like an absolute outcast and we need to protect our child’s environment by encouraging and empowering clubs to handle them (sadly, that may mean cutting their child) and by not giving them a voice. Soccer will be so much more enjoyable when the Crazy Soccer Parents are no longer a part of it. We need to strive for a time when the Crazy Soccer Parents are extinct or irrelevant. 5. A lack of understanding about soccer development. Each of these five areas can be addressed and when parents gain understanding and clarity about how to deal with them – the stress is greatly alleviated. When I am speaking to clubs and parents around the country I am consistently met by parents who tell me they wish they had heard my message years ago because their child’s experience would have been so much better if they had done more to understand and alleviate their personal stress. Clubs are starting to see the value in engaging and educating parents to help them deal with this stress. Coaching education is being completely redesigned across the country by U.S. Soccer and the NSCAA as they have launched and/or are launching new courses dealing with 4 vs. 4, 7 vs. 7, 9 vs. 9 in an effort to better guide coaches in their understanding of how to most effectively teach the game to specific ages. This is good, but not enough. Soccer lost a legend recently when Tony DiCicco passed away. Tony’s legacy goes well beyond his win-loss record, his Olympic Gold Medal, his World Champion winning 1999 team, his U-20 World Cup title. Tony’s legacy goes beyond the goalkeeper education he oversaw, the women’s professional league he Commissioned, the professional and youth teams and players he coached. Tony’s legacy will be his ability to connect with people – to clearly and joyfully see the person before he saw the player or coach. This is what must change in youth soccer. Demanding More of Coach Education doesn’t necessarily mean revamping the courses that are offered, restructuring the licensing pathways or changing curriculums. It means completely rethinking what we are trying to accomplish when we educate coaches, acknowledging first and foremost that we seek to develop a generation of coaches who, like Tony, seek to positively affect the lives of the players they work with. There is no group of people better positioned to ensure this type of coach education becomes a priority than parents. Our children playing 5 games in two days at a tournament is not safe or healthy. Our young players playing one sport for over 10 months of the year is not in the best interest of their long-term athlete development. Parents need to embrace these notions and advocate for their child’s environment. More than ever before our young players have parents who are familiar with the game, who played it growing up and who have watched it on TV. This familiarity enables parental perspective; the more familiar all parents become with the game, the more they will understand the process that is involved in development. Parents who understand the nuances of the game are also better positioned to make the best soccer decisions for their child’s environment. These parents are more likely to feel confident following their instincts when making choices about which club their child will play for not by their win-loss record, their tournament participation or the messaging of the coach – but instead by what they see on the field and in the hearts of the players. We’ve been telling parents for years to not talk on the sidelines, and this messaging is simply not working. It’s time to do something different when it comes to sideline behavior. The staggering shortage we have in youth referees is a testament to the ridiculous behavior we have come to accept as normal on our sidelines. It’s time for a big reality check here. Parents need to stop yelling at referees. Parents need to stop coaching on the sidelines. Parents need to stop relieving the stress they are feeling during a game by invading their child’s experience. Parents need to be educated on the difference between supportive and distractive communication and they need to 100% put an end to distractive communication. Hostile communication must be handled swiftly by clubs, coaches and referees by not allowing parents to attend their child’s games if behavior doesn’t change. If parents leave the club as a result of this – then that is fine. We can’t live in fear of this happening and allow repeated hostile communication. The Soccer Parenting Association has launched The Sideline Project at clubs all across the country. If you are interested in learning more about The Sideline Project follow this link. Are you ready to get more engaged, more connected to youth soccer so you become an active part of the solution your child and the next generation of soccer playing children deserves? Great article as usual. I like the emphasis in finding ways parents can help versus shunning them as most clubs and coaches do. Game looks so simple until you really it them down and explain its nuances. In addition, good parents can really make a difference in encouraging touches at home, which every coach would agree is helpful. So coaches stop pushing parents away….educate them and use them as an asset.